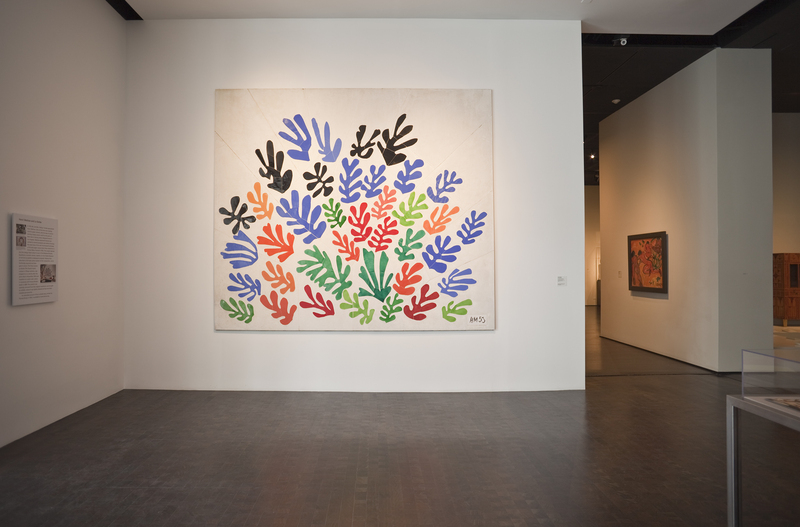 Now on view at LACMA is Henri Matisse: La Gerbe, a new exhibition that examines in depth the artist’s final commission, in 1953. The artwork has been permanently on view at LACMA since 2010, but the new exhibition provides context by showing Matisse’s early maquette (on loan from the Hammer Museum) and other works created around the same time, including Madame de Pompadour (1951) and a complete set of his Jazz portfolio (1947). At the time of La Gerbe‘s installation at LACMA in 2010, senior curator and department head of modern art, Stephanie Barron, told the story of how the artwork came to LACMA. In honor of the new exhibition, we re-print that blog post below. La Gerbe installed in Brody residence. Photo courtesy the archives of Frances L. Brody, now at LACMA. The journey to today has been a long one. I remember discussing the possibility of this gift to LACMA in 1986 when she indicated that she would be willing to promise it to the museum in honor of our 25th anniversary. At the time she shared with me the fascinating story of the commission, showed me correspondence about the acquisition, and regaled me with amazing details about meeting Matisse. 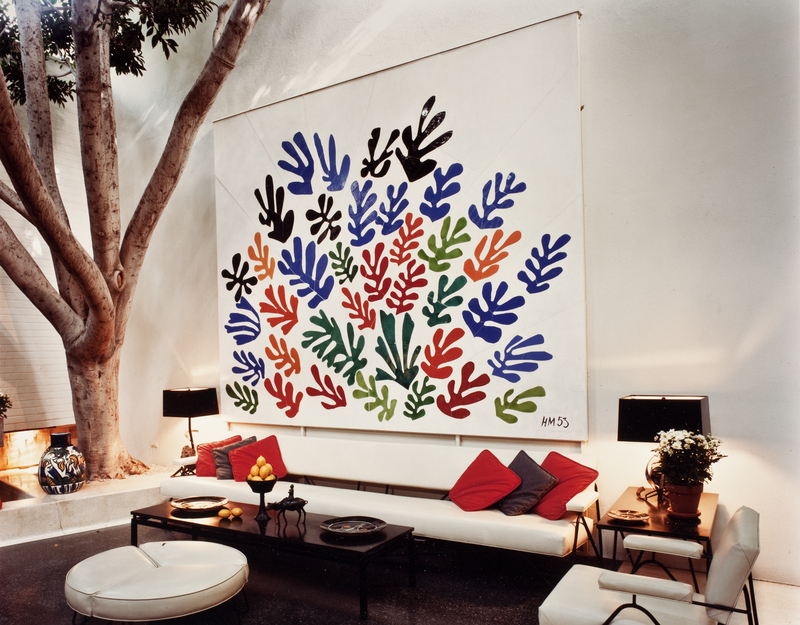 In 1952 the Brodys approached Matisse, who at the time was creating colorful paper cut-outs, with the idea of the commission. 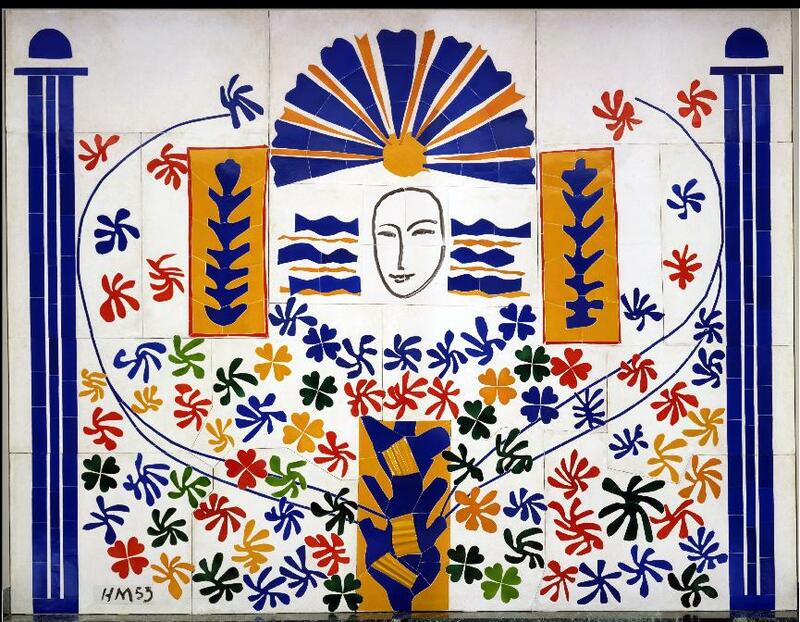 Matisse expressed interest and worked on several proposals even before knowing the exact size of the wall. He showed the Brodys a full-scale paper cut-out when they visited him in Cimiez (Nice, France) in May of 1952. They rejected this first design (that cut-out is today in the Moderna Museet, Stockholm; a ceramic version, Apollo, is in the Toledo Museum of Art), but accepted a subsequent proposal. The Brodys also acquired the full-scale maquette of La Gerbe, which they subsequently donated to UCLA. The final ceramic, created in fifteen sections, was shipped to L.A. shortly after the artist died in November 1954. 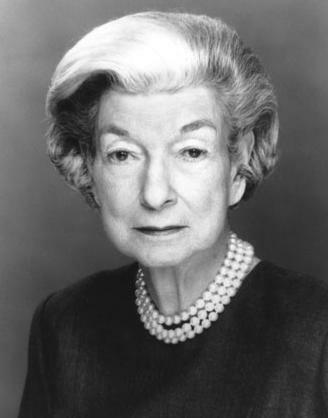 Sadly, in November 2009, Frances passed away at age 93. As promised, she left the Matisse to LACMA in her will. She was a remarkable figure in Los Angeles’ history, whose grace, style, erudition, and opinions were truly legendary. In January we began the adventure of deinstalling this 2,000-pound ceramic wall, which had remained in its original position for more than half a century. It was, to say the least, a delicate and difficult procedure. 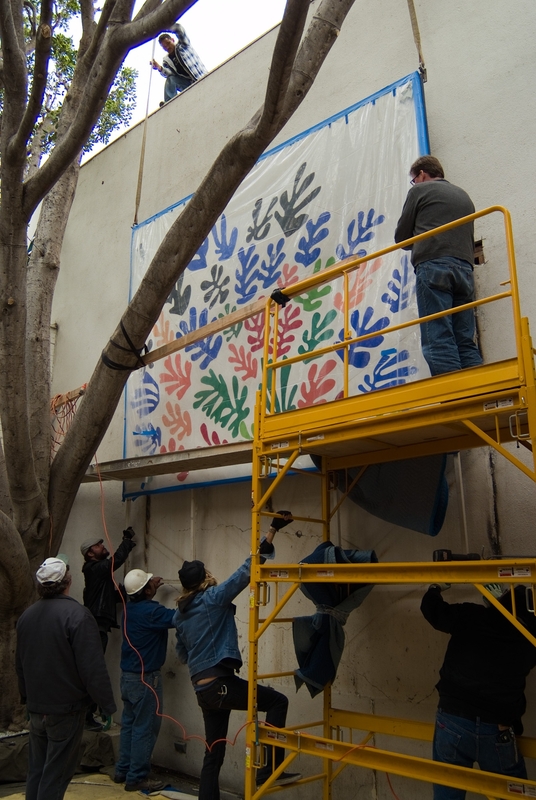 Thanks to the ingenuity of our team, we were able to literally detach the mural from the wall in one piece (it was bolted to the wall) and crane it out over the house and trees to an awaiting flatbed truck. 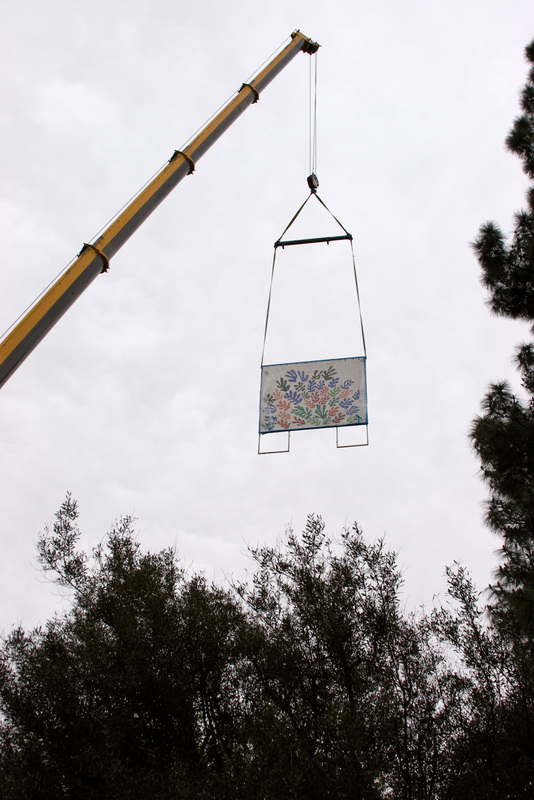 Watching the Matisse hovering in the air high above the trees was one of the most heart-stopping moments I have ever had as a curator. Safely ensconced in a secure a-frame, the ceramic eventually made its way to the museum. After close examination by our conservation department, the decision was made to do a light surface cleaning and prepare the ceramic for permanent installation in the museum. 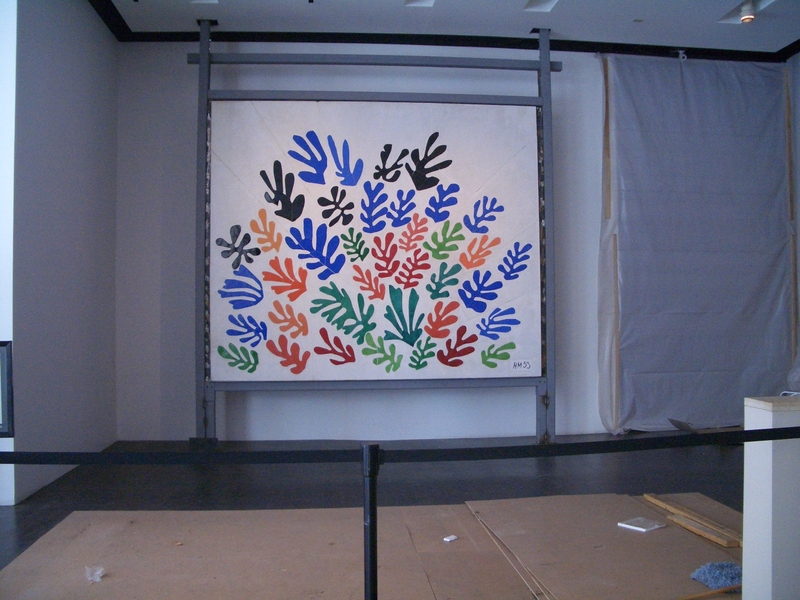 A prominent wall in the lobby of the Ahmanson Building was selected as the appropriate permanent location for this monumental Matisse. The ceramic was carefully rigged, gently positioned on the wall, and attached to a steel structure; a wall was then built around the work. Frances Brody, cognizant of the commission’s significance, wrote a fascinating account of the commission, which I think best describes the transaction. This entry was posted on Monday, April 22nd, 2013 at 7:53 am and is filed under Uncategorized. You can follow any responses to this entry through the RSS 2.0 feed. You can leave a response, or trackback from your own site. I read on one of LACMA’s sites that Matisse made a serigraph of La Gerba,which he signed. Does the Museum have this?